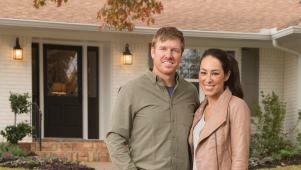 Chip and Joanna Gaines take Jo's old high school buddy Jonathan Gulley and his wife Amy on a tour through three houses in the suburban neighborhood of Woodway, Texas. The Gulleys are returning to Waco after a 10-year hiatus in Chicago to be closer to friends and family. They're seeking a 4-bedroom home with a large kitchen, nice garden and a big backyard for their 2 kids, 2 dogs and extended family. Amy's biggest fear is flooding after a disastrous experience at their previous home. Will they choose the 'Fun House' with the funky multi-layered layout? Or will their choice be the 'Neat and Tidy Ranch House' with tons of trees but a very vanilla exterior? Or will the winner be the 'Tire Swing' house with the sloped backyard? Chip's nerves are on edge as the Gulley's new house shows signs of previous flood damage on top of an unexpected $8,000 HVAC problem. Could this deal mean the end of a long friendship for the Gaines and the Gulleys? Chip and Joanna welcomes a family friend home with an updated house.